The dishwasher share a lot of dirty work, but it needs care. From this article you will learn how to properly clean the dishwasher. The dishwasher falls most of the dirty work in the kitchen, but it needs regular maintenance. 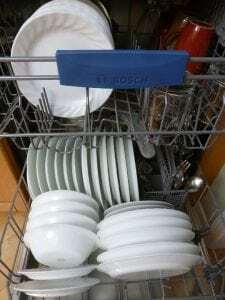 From this article you will learn how to properly clean the dishwasher. Leave the dishwasher door open for 10-15 minutes after each wash cycle to avoid forming a moist and warm environment that is favorable for the propagation of bacteria. Regular cleaning of the dishwasher will not only give it a neat appearance, but also increase efficiency and extend its life. There are many ways and means for cleaning the dishwasher, from specialized cleaners to homemade recipes. This five-step instruction contains all the information on the care of the dishwasher. Stock up with a pair of rubber gloves that protect the skin of your hands from grease and dirt, as well as the negative impact of home-made abrasive cleaners. When using specialized cleaning agents, carefully follow the instructions on the labels. Open the dishwasher door and clean the top and side surfaces. To remove accumulations of dirt in hard-to-reach areas, use an old toothbrush, soaking it in hot soapy water. To deal with severe contaminants and fats, use specialized cleaning agents. Remove any debris and soapy foam, carefully wiping the surface with a soft cloth soaked in warm water. Remove the cassettes and other accessories from the dishwasher and rinse them thoroughly, removing food and dirt. To get rid of the plaque, rub the problem areas with an old toothbrush soaked in soapy water. Do not forget about the nebulizer, carefully brushing it to avoid blockages. Remove the dishwasher tray and check the water drainage system. Remove large debris to avoid blockage and damage to the drain hose. You may be surprised by your findings – glass fragments, bones and cutlery are not often stuck in the drain hole! The clogging of the drainage system can also cause an unpleasant odor in the dishwasher, so do not neglect this cleaning step if you want the device to serve you long and well. If you prefer natural alternatives to specialized products, try cleaning the dishwasher with vinegar. Fill the bowl with distilled white vinegar and place it on the top shelf of the dishwasher or, if it does not fit, pour the liquid into the pan. Making sure that besides the bowl with vinegar in the dishwasher there are no extra items, turn on the device for maximum operation. Vinegar and hot water perfectly disinfect the dishwasher and remove the remnants of dirt and grease. Wait until the end of the work cycle and leave the door open for half an hour to get rid of excess moisture and sour odor. After cleaning with a specialized cleaner or vinegar, use washing soda to refresh and refresh your dishwasher. Pour soda into the dishwasher tray and turn on the appliance for a short cycle of operation at maximum water temperature. Washing soda not only removes stubborn stains, but also helps get rid of the unpleasant odor. After you have finished cleaning the dishwasher, do not stop there! In this article you will find many other useful tips on cleaning in the kitchen. This entry was posted in Cleaning Products, Cleaning Service, Cleaning Tips, Kitchen, Maid Service, Tips and tagged Cleaning products, cleaning tips, Dishwasher, Home Cleaning, kitchen. Bookmark the permalink.